Dove tattoos have become very popular among men and women. These tattoos are made of a dove or a dove with variety of words and symbols. They can be of small size or big size making them ideal for every part of the body. A dove has been one of the most widely used symbols. For instance, Christians associate themselves with dove since during the baptism of Jesus; the dove appeared with a symbolic meaning. From then, the dove has been used in many pictorials and eventually ended up being used in tattoos. Dove symbol means a lot of things and implies the same meanings in dove tattoos. 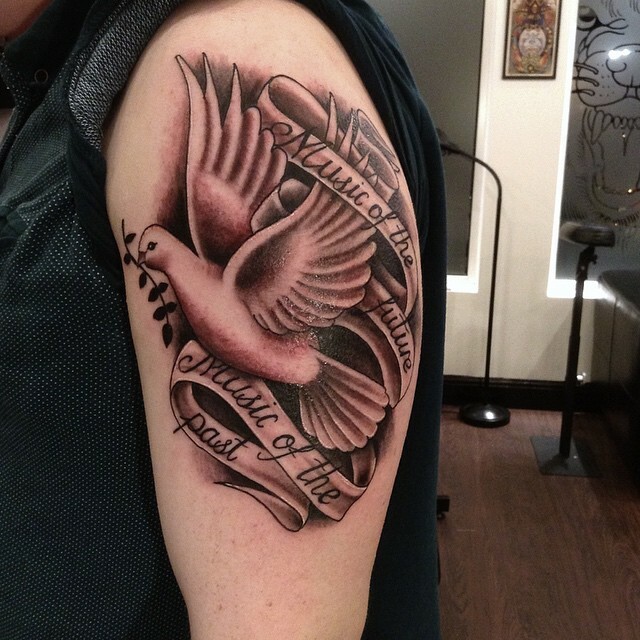 Below are some of the most popular meanings for dove tattoos. 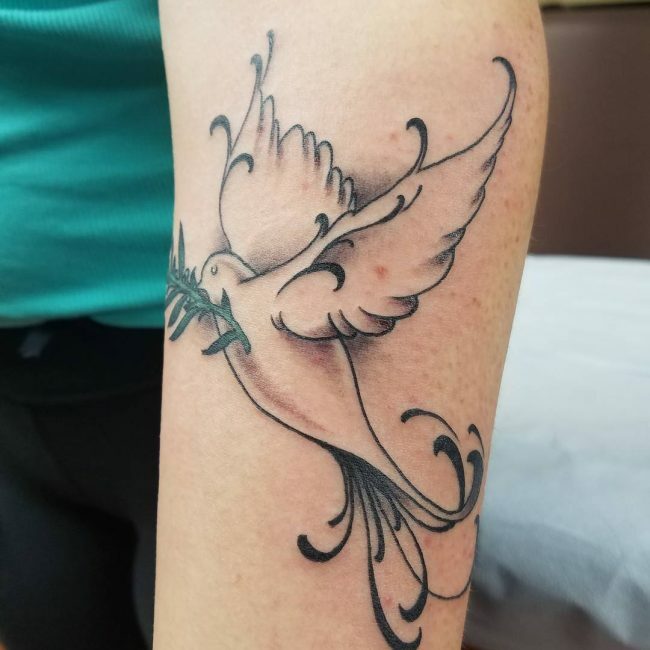 A white dove holding an olive branch has been used by many Christians as a symbol of peace. In fact, peace is globally symbolized by color white, Hence a white dove and an olive branch means peace and harmony. One of the characteristics of dove is that once they mate, they live together for a lifetime. The male and female sticks together in love and raise their young ones together. This shows steadfast love that is endless. 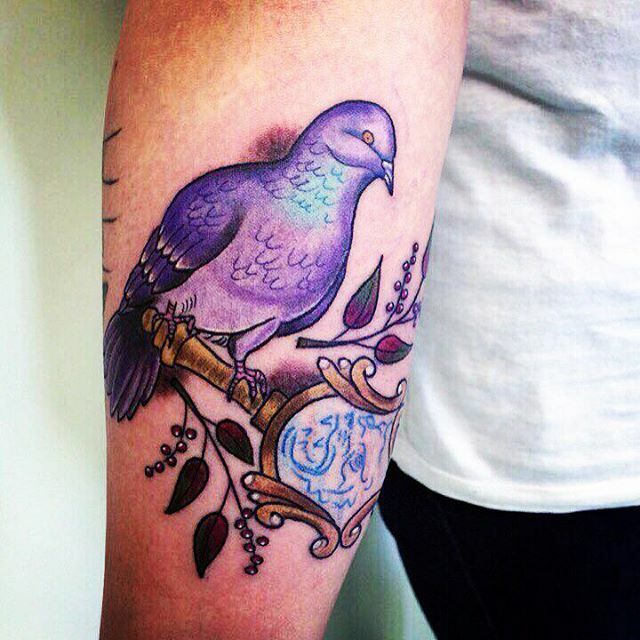 Out of this, many have made tattoos with two doves male and female to symbolize endless love. From the religion perspective, a dove tattoo would also symbolize messenger. Occasionally, scripts in the bible show a dove being sent by God to deliver a certain message to human beings. As a result, doves have been used to symbolize messenger. In the Bible from the story of Noah, there were two doves that were used to symbolize a fresh start. This has resulted to doves being used in tattoos to mean a fresh start. This is so common among dove tattoos because human beings are fond of making mistakes but when they realizes they are trending on the wrong path, the decide to have a new beginning by doing things right. This value is related to the endless love. 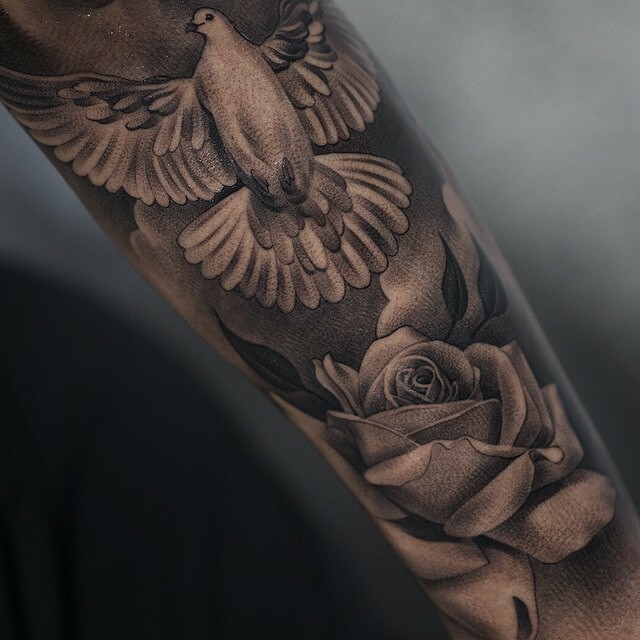 The two male and female doves in dove tattoos can also be used to symbolize a family. Dove’s way of living shows by example how a family should be. The husband and wife should stick together in good times and bad times and take care of their children. Doves do not separate till death; the same case should apply to a family. A dove tattoo comprised of a dove holding an olive branch can be used to symbolize success. The success factor is brought about by the olive branch. People use this tattoo to show success in different aspects of their life. Christians believe in the existence of the Holy Spirit. As mentioned above, Jesus was baptized and two doves landed on her shoulder. According to Christians, this was used to symbolize the presence of the Holy Spirit. Therefore, some Christians have dove tattoos as symbolism of the Holy Spirit. Having understood some of the main meaning of dove tattoos, let us now have a look at some of the designs that have been designed for dove tattoos. This is an amazing design for couples or those in relationships. It is made up of one dove holding a lock and another dove holding a key flying towards the one with the lock. The best position to have this design is on the chest since it is used to symbolize love and partnership. It is an amazing design to have. This is a very common design. Though very popular, it has never become obsolete. As mentioned above, it is used to symbolize victory or success. It can be drawn anywhere. It is one of the oldest designs among dove tattoos. Besides the illustrated meanings above, dove tattoos can be used to send some other meanings by use of this design. A dove holding a ribbon using its beak is drawn. Words that the beware want to send are written on the ribbon. The design can be made on any part of the body. For instance, the ribbon could have date of death of someone special. This makes the tattoo to be used as a memorial tattoo. This is also another common tattoo. It is mainly worn by ladies. The design comprises of a dove with wings open holding a yellow rose using its legs. It is a cool tattoo especially due to the blending of the colors. This is designed by having a dove that is holding a branch with flowers. Beneath the dove, the words love, hope and faith are written in calligraphy. This is very common among Christians because these words are the core values for a Christian. This design is common among men. It is done on the hand. A dove flying upwards is drawn in color black and white. It is drawn in a way it looks submerged in clouds. 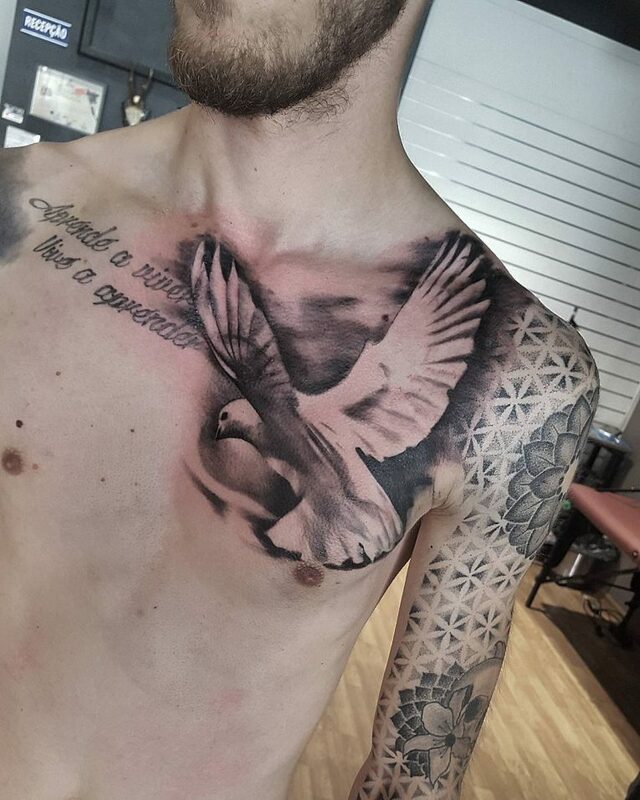 The clouds give the tattoo a nice effect which makes it a good dove tattoo design. A tiny dove is an ideal tattoo if one is considering placing the tattoo at point that there is little space. For instance, some ladies like their tattoos drawn at the back of one ear. Tiny dove tattoo would fit in that location and still give out the intended meaning. It can be drawn even on one finger. This design is mainly used to bring out the symbolism of a messenger. Angel are believed to be God’s messenger and when a dove is drawn with the wings of an angel, most likely that is the intended meaning. It is also a nice design to adopt. Dove tattoos are so many and it all depends on the message you want to bring out, Therefore, before having one, it is important to understand the symbolism behind the tattoo. Otherwise, they are nice designs which are worth having.